Does Corsair's Dominator offer high performance for its high price? Money no object, this is our pick of the dual-channel bunch. £140 is a lot of cash for a dual-channel 4GB memory kit, even one rated at a lofty 2,133MHz. In fact, look a little closer at the Corsair Dominator GT 2133MHz's specifications and the pricing looks even more preposterous. After all, timings of 9-10-9-24 are nothing special, even taking into account the flighty frequency. However, that would be to disregard a number of benefits that come with this DDR3 kit. For starters, it's made by Corsair, and that means it's about as impeccably hewn and physically desirable as they come. There's nothing flashy or adolescent. It's just quality engineering and it bodes well for operating at high frequencies. You also get Corsair's Xtreme Cooling System which involves a twin-fan cooling attachment that clips on top of the DIMMs. With all that in mind, the extra £4 Corsair is demanding compared to Geil Evo Two 2000MHz actually looks pretty reasonable. 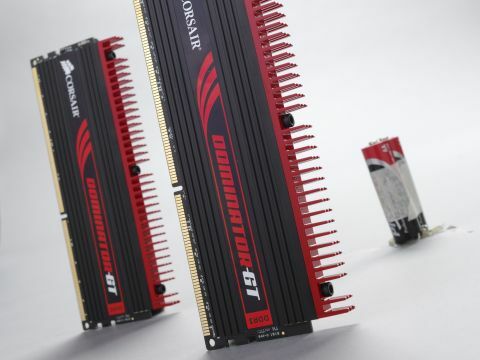 Given the tardy timings, it's no surprise to find the Corsair Dominator GT 2133MHz's raw throughput and latency is a little off the pace compared to other 4GB DDR3 kits when running at 1,333MHz. Much cheaper dual-channel kits such as the OCZ Platinum 1600MHz knock out better numbers pretty much across the board. Of course, we're talking about fractions here. Yes, you might lose a frame per second or two in gaming. But overall, the knock on effect on real-world performance is negligible. Still, wind things up to 2,133MHz and the picture generally looks a lot healthier. Raw bandwidth leaps to nearly 26GBps and measured latency is much, much improved. Gaming performance certainly takes a big step up, too. In fact, you might see as much as 10 per cent more gaming performance compared to running these DIMMs at 1,333MHz. But what about overclocking? Given the sky-high official frequency, it would be a bit rich to claim disappointment that no further headroom from the Dominator GTs is forthcoming. Moreover, at these kinds of speeds, motherboard and BIOS limitations often begin to complicate matters. The bottom line is that there's more than enough frequency on offer for both outright performance and overclocking flexibility. As for the twin-fan cooling kit, it's difficult to judge how effective it is. But we can reveal the following. It's very nearly silent in operation, it keeps the DIMMs cool to the touch even under heavy load and it doesn't come at a significant penalty in terms of power consumption.